Hey, A.V. Club reader. This is it. Our site is now live on Kinja, bringing The A.V. Club into the same publishing fold as the rest of our new friends at the Gizmodo Media Group, and completing a transformation that has been many arduous, anxious months in the execution. We’re gonna try not to break it. If you’re just joining us for the first time, hello! We’re The A.V. Club, a site written by the pop culture obsessive for the pop culture obsessed. Please have a look back through our two decades of online coverage on film, TV, music, games, food, books, comics, podcasts, and all other facets of the cultural dialogue so you can get caught up. We look forward to getting to know you, then confusing you with all of our inside jokes. 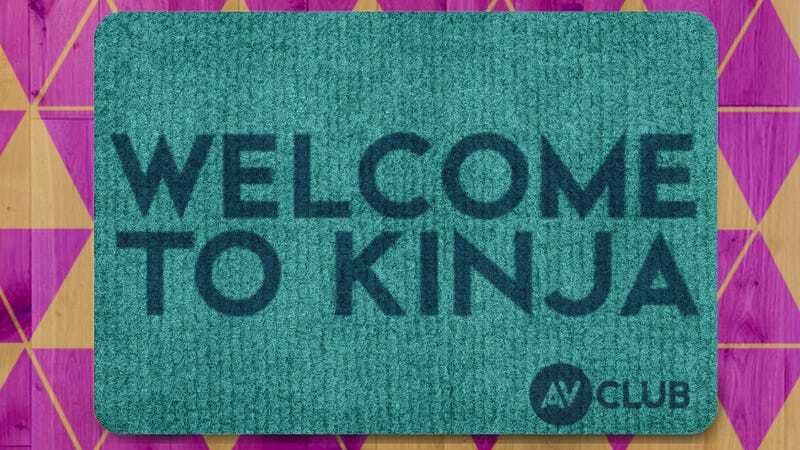 Finally, if you haven’t already signed up for a Kinja account, either as a new user or through your A.V. Club username, there’s instructions below on how to do that. You will have until 11:59 p.m. Eastern on Monday, September 25, to follow these instructions, after which these claim pages will no longer be available. Nothing you do here will affect your Disqus account or any comments you’ve made elsewhere using Disqus. You’ll also be happy to know that your fellow commenter Tyler Scott (a.k.a. Mark Bowen) took it upon himself to build a nifty Chrome extension that will nest Kinja comments, which might make you feel more at home. As we promised, all your comments on Disqus will migrate over to the new site, and you’ll see those start trickling in tomorrow. Let us know that you made it safely. Then we can get started. Go to the Disqus to Kinja account claim page. Click the blue “Claim Your Account” button. If you’ve returned to the claim page after clicking the claim button, head over to avclub.com and click the user icon (the gray silhouette) in the top right corner of the page. If you’re asked to choose a username and display name, close the window, log out of Disqus, clear your cache, log into Disqus, and kick off the Claim process again. If you’re not already logged in to Disqus, log in with the account your A.V. Club comments are associated with. You’ll be asked to allow Kinja to access your Disqus account. A modal window will open that allows you to add a login method. This will be the account that you use to log into Kinja from this point forward. Updated: Burner accounts can no longer be used in this claim process, and we’ll update you if that changes. If you select burner, make sure you copy your burner key. This key is your account password and will never be displayed again outside of the account creation process. If you lose this key, you can get locked out of your account. Learn more about burners. If you still have technical questions, you can contact our tech team here. To comment on the new site, create a new Kinja account. If you choose to create a burner, you will not be able to merge your new account with your legacy account once they are ready to be claimed. Once legacy accounts are ready to be claimed, you’ll be able to merge your AVC legacy account with your new Kinja account. We’ll have instructions for you soon, and we’ll make sure you have plenty of time to do it. If you have technical questions in the meantime, you can contact our tech team here. A modal window will open that allows you to add a login method. Since you already have an existing Kinja account that you want merge with your newly created account, select the login method and account associated with your existing Kinja account. Learn more about merging accounts. If you choose to merge an existing Kinja account with your new Kinja account, the existing account will become part of the new account. The new Kinja account will use your Disqus username, or a close variant if that username was taken. All your Kinja posts and comment activity will now appear under the new account; however, your follows and site memberships will be lost. If you want to use your old Kinja username, you can rename your new account to your previous username. Learn more about renaming your account. If your existing Kinja account is a burner, you will not be able to merge accounts. Learn more about burners.